A few weeks back I went with only one bag, ready to fill it with orphan library books. It was that time of year again when the library takes stock, unloading its shelves of books that will find happy, new homes. I’ve perused Gretchen Rubin’s The Happiness Project in the past, but didn’t immediately jump to action. When I saw a beat up copy of the book staring out at me, I thought now seems the right time to dive in, figure out some more simple pleasure that I can add to my list and find new perspective in the familiar. There was a “Damage Noted” sticker on this one: “ragged, readable.” I taped up the front and back cover to reinforce it to get more use out of it before it starts to fall apart. I found some other books; I could’ve taken more bags, but I made a deal with myself that one bag was enough. I did also end up carrying a few books under my arms. I’ve been dipping in and out of books. At one point I was going to pick up, in book form, where I left off in the audio version. I didn’t recognize anything, then I realized it was the wrong book and felt better. I sometimes worry that I’ll start losing track and cross plots and characters amongst the books I’m juggling. I’m usually pretty good about keeping it all separate. It’s challenging though, in the sense that I yearn to get back to one book, then another pulls me in, and that other one over there is saying, ‘read me, read me.’ All these books are vying for my attention. Sometimes I know right away if a book and are will get a long really well; other times, I need to keep going a little longer to see if we’re a good fit. And still other times, I will feel satisfied right where I’ve stopped–forcing a new ending because another book is calling. One book I almost gave up on is Antoine Laurain’s The Red Notebook. I’m so glad I didn’t. Month’s ago I started reading it, then put it aside. I had also downloaded the audio and started listening to it, then back to reading it–then perhaps it was being in one of the small bookstores looking through the tables of recommended books, and just maybe it was the woman nearby, also looking, searching, whom looked to me and said I loved this book, have you read it. I looked and because it was the hard cover, I didn’t immediately recognize it, then I said, “well, I started it, but haven’t finished it yet. I do believe it was her nudge that brought me back to the audio version. A sweet love story, that talking about, is making me want to go back for a visit. One book that I recently downloaded is A Concise Chinese English Dictionary for Lovers. It’s different, in the way it’s organized through words–through the words the protagonist is learning, sprinkled with Chinese sayings. It has intrigued me and I think I’m in for the long haul. I want to see where this goes, how the language and thought process develops, how it ends. Traveling through books is one of my favorite pastimes and also reading about peoples lives. I don’t always know whose lives will pull me in, wanting to read more, wanting to get to know the person more, read (hear about their experiences). A couple of these that have recently come to my attention are Take Off Your Shoes: One Man’s Journey from the Boardroom to Bali and Back by Ben Fender. I am looking forward to traveling alongside Mr. Fender and his family. I’ve read up until the point where the transition begins and am happily awaiting getting back to the journey. The writing is clean and already I feel like I’m just beginning to know his family. Driving Miss Norma: One Family’s Journey Saying Yes to Living by Tim Bauerschmidt and Ramie Liddle. How could I not be inspired by a 90 year old woman, who is diagnosed with uterine cancer, and decides to say yes to life , join her son and daughter-in-law on an adventure on wheels, living out the time she has left in what may possibly be her last hurrah. I came across these books from the daily BookBub email that I signed up for. I have found out about many great deals from them. It’s great! I came across the book, The Novel Cure while I was looking for another book in the library shelves. I like the concept of being prescribed a book for what ails you. I also like the idea of being introduced to books that I may not come across or some that I’ve read to see what the ailment was. A fun one to flip through. Here I sit, writing in my journal, one of my tippity-top forms of happiness and one of which I’ve been depriving myself from enjoying. feeling my muscles tense with the chill. minty freshness perks my senses. making the day feel alright. It’s nice to have a day off. I’ve been in my new job now for a little over five months. The timing was right to leave my old job and I had no idea or expectation that things would work out as they did. I did put my faith in God, in the higher powers of the Universe; I prayed for guidance each day to let me know, to offer some sign…now here I am, with many serendipitous moments along the way. I feel grateful. 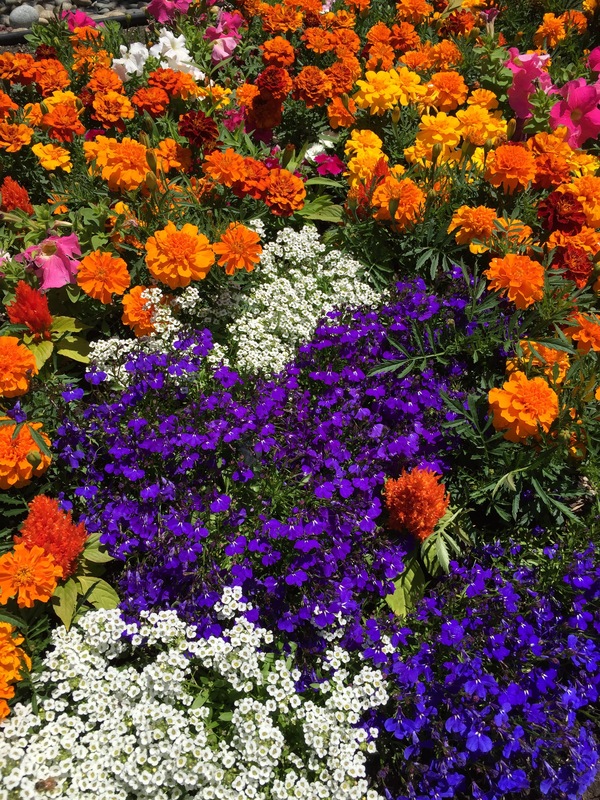 There is a probationary period–9 months; after I reach that hurdle, it will be official. Until then, I wait, I work, I rejoice for the opportunity. Today I visited the library, it’s where I gravitate on my day’s off. I visited two today and here I sit in the second as I type these words out. I always enjoy browsing through the “New Books” shelves to see what I may have missed. I checked out a small stack and purchased two used books from the Friends of the Library bookstore. I had listened to the audio of The Elegance of the Hedgehog by Muriel Barbery years ago and have recently wanted to revisit it in book form. I remember listening intently to the story and am glad that I listened first. It may have been harder for me to find the right voices in my head for the characters and I may not have been as open to the young character who is planning her suicide. Another audio that I’m happy to have listened to is Anna Karenina read by the actress, Maggie Gyllenhaal. I had sampled other versions, the readers not piquing my interest, but when I read about how much she loved the story, and upon hearing for myself–the care and passion that comes through effortlessly, I was immediately drawn in and have since listened to the story several times over. What a treat to the ears, the mind, and heart. At my first library stop, fiction mostly was the aim. Here at my second stop, creativity and food won me over. It is getting close to lunch, so of course a bowl of soup or any Latin American dish sounds scrumptious. I couldn’t pass up Literary Yarns: Crochet Projects Inspired by Classic Books by Cindy Wang, since I love anything to do with books and my mother-in-law has been knitting hats, I thought she might enjoy a look at this book for some added inspiration and whimsy. I’ve always enjoyed audio books and lately I’ve listened to more and more because I have extra time in the car on my way to and from work. I still read books, more slowly than usual. But even if I only get to know a book quickly, read a small portion of it–I tell myself that it counts for something; it counts for getting to know the book, if only a quick tryst. It’s better to have been acquainted, than our paths never crossing. A quick hello, or time over a cup of tea, and then goodbye, possibly only having this one chance meeting or perhaps our paths will cross again. This morning, I knew that when I left the house, I would be stopping at the coffee shop before work. I knew I would attempt to write something on my blog, and I knew that there was a book that I wanted to share before so much time went by, that the thought fell away. At this particular coffee shop, there is a waterfall in the background, trees, and large cement structures that hold bright pink and white flowers and other textured shrubbery. Usually, if I stop for coffee, it’s in and out, then off to work. It feels like my little piece of Zen–the soothing sound of the water swooshing out, bees buzzing here and there, and the canopy of trees that makes me feel like I’m in a tree house–these beauties get my day going in a peaceful direction. 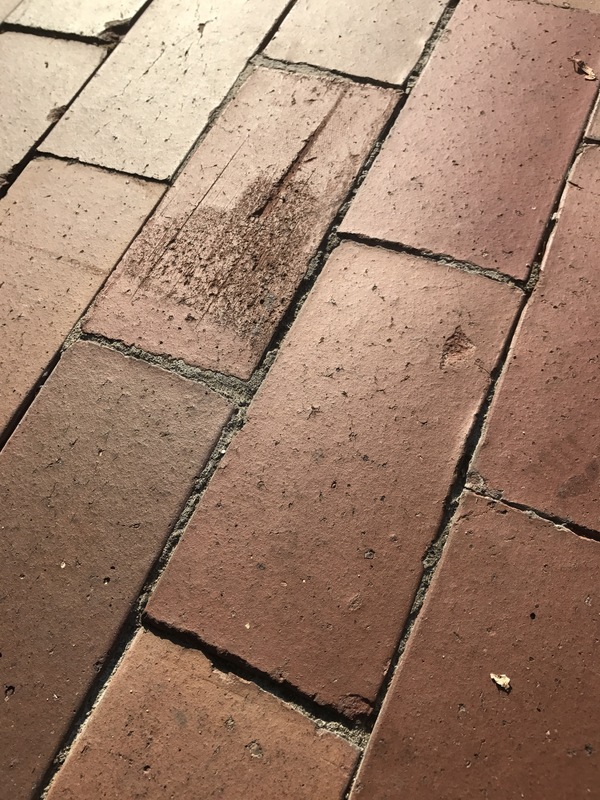 This morning, as I sat at the table, before I opened my iPad, I stretched to the left to help alleviate some muscle stiffness and what did I spy, but a heart shape on one of the red bricks. This brought a great smile to my being; and it felt like that feeling you get when you feel like the Universe is speaking to you–as though the Universe is smiling or tickling your funny bone. Here I was sharing a heart yesterday, a heart that I had taken a photo of a long while ago; and here, this morning, another heart appears in the present moment. Such a wonderful feeling. The book that I’d like to share that is written for young readers and the young at heart is The Poet’s Dog by Patricia MacLachlan. I was lucky enough to come across this when my mother-in-law came across it in one of her book catalogs. She passed it along to me and said how much she loved it. I happily accepted it and put it on a nearby shelf to be read when I felt in the mood. It’s a very short story that can easily be read in a short sitting. I chose to read half in July and was drawn to finish it recently. I was taken with its beauty, with the love on those pages. It’s a special book to be read and shared. For anyone that loves dog’s, children, poetry–they will especially appreciate this book. When I first learned of this book a few years ago, I never would have expected what I found within its pages. I appreciate snails, but I never imagined that I would want to keep reading of the companionship that one humble snail would offer to its newfound keeper and continue learning more. The writing is beautiful in an understated way. The descriptions of the author’s country home and nature transport, and the details allow the reader into this intimate space. I never feel Elisabeth Tova Bailey feels sorry for herself in a way that takes away from her story or journey. 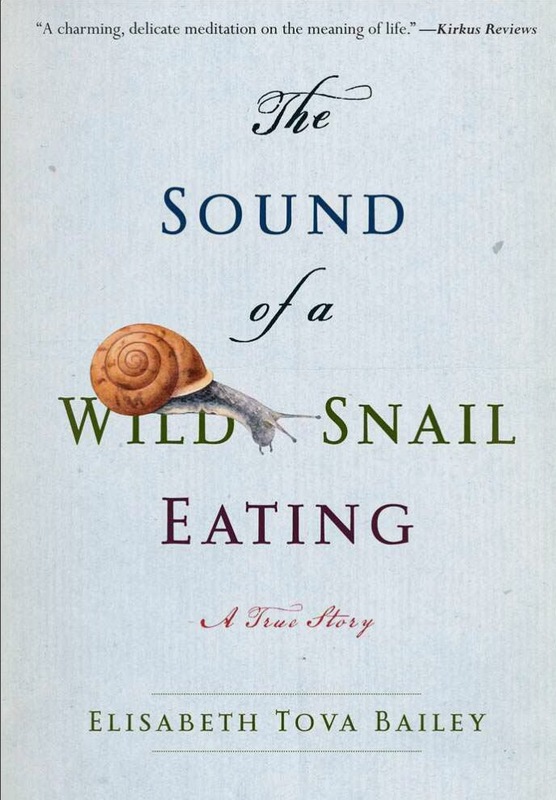 I feel a kinship with her and her snail who becomes the shining star in this memoir because of her strange, debilitating illness, that comes upon her suddenly when she’s on her way from her travels to home. A gentle and beautiful read that I’m happy to have stumbled upon. From time to time, I search the internet for writing prompts to help light a spark. I was browsing Amazon and came across this one. I read the few reviews and decided that for $2.99, why not. 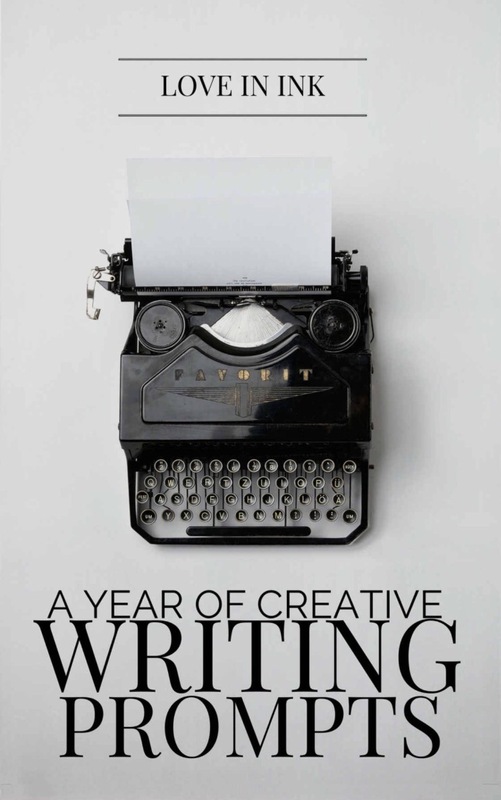 It provides three writing prompts for each day for the whole year. There’s a Five-minute prompt that consists of one word, a Midday prompt, and a dinner prompt. You can also view the prompts by genre if you have an idea of the direction you want to go. I’ve done the prompts for the first day and have peeked around at the other prompts. I like how the Kindle book is laid out. Simple and clean. Just reading the prompts gets the juices going. I hope to continue on and get back to a daily writing schedule just to keep the sparks from completely burning out. I haven’t decided if I’m going to respond to the prompts in a paper journal or a Word document or some other application. I love paper, but sometimes, it’s easier to keep organized using technology. Evernote is another option that I considered. There’s something that I’ve always found exciting about grab bags or–now–these blind book dates, something about being surprised, not knowing, figuring it out, finding something you might not have. So, I had my first ever blind date with a book two weeks ago. The local bookstore has been doing this through the month of July. Donate a small amount of money, and take a book on a date. I don’t make it to this particular bookstore all that often; who knows how many opportunities I missed. An assortment of books vied for my attention, all wrapped in the same brown paper outfits with a single clue written upon them. The one I chose had this clue: Australia late 1940s–novel re: renewal & moving on. 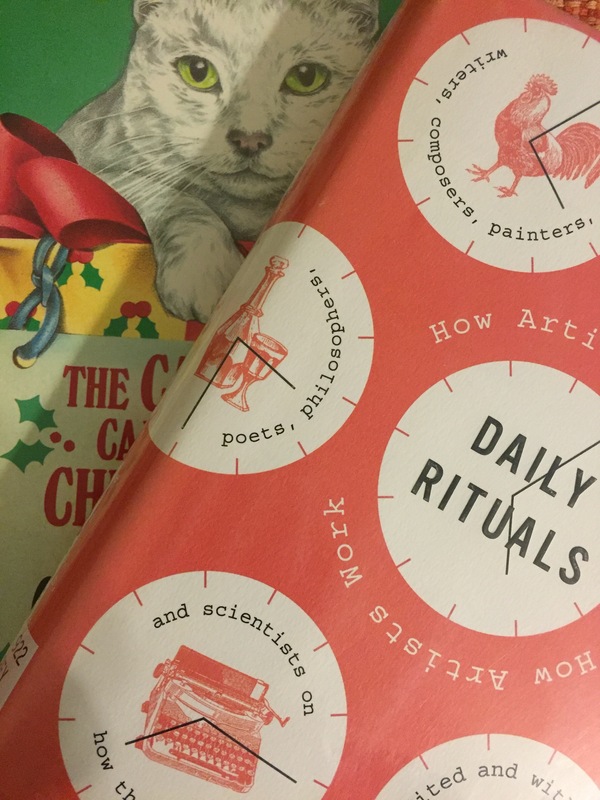 I couldn’t wait until I got home to carefully peel the wrapping off to see which book would be waiting. Upon unwrapping the mystery book, the title that looked back at me was, The Railywayman’s Wife by Ashley Hay. I had never heard of it. By now, it’s been a few weeks, and I’m happy to report that the date was a success. I only got through the first 25 pages, but I was interested in the family and wanted to learn what would happen next. With so many other books competing for my attention, I plan on returning to its pages soon. Next, I was off to find a book of my choosing. I love reading about books and especially why certain books are important to other readers, so I couldn’t pass up, The Books that Changed my Life: Reflections by 100 Authors, Actors, Musicians, and other Remarkable People by Bethanne Patrick. I am throughly enjoying it and am purposefully taking it slow, although, it reads quite fast. I want it to last a while longer than it might normally. Already, there are several more books that I want to read because of this book and others that it has reminded me of. I’ve since been back to the store because I had a coupon to use. I saw a book that seemed like it would be funny. It was between it, the funny one: Dating Tips for the Unemployed or Keep Me Posted. I wish would have gone with Keep Me Posted. As I started reading more of the other one, once I owned it, there just wasn’t a connection. The book and I were definitely not a match, which I should have know, but I was really looking forward to something funny and different. I had flipped through it in the store, as I usually do, but somehow, I was hoodwinked. I like trying new things; this one just didn’t work out. I went on two more blind book dates. One was a memoir and the other was science fiction, both new books to me. The memoir wasn’t to my liking and the science fiction book sounds interesting, but the first few pages didn’t pull me in as much as I would have liked. I may have to come back to that one when I’m in the right mood. If I see other bookstores that offer blind dates with books, I will most definitely be participating! And the money goes to a good cause. It’s ironic that I’m reading more since I’ve been taking classes to complete the A.A. in accounting. Better late, than never. Now that our living situation is different, after work I go to the library almost everyday to study. Usually I only take one class per quarter because it’s all that I have the energy or focus for; however, I’m getting close and have decided that I will take two courses next quarter begins. Summer session is almost done and I finally get a small break before the Fall quarter. At this point, I feel like I’m doing this A.A. degree more for myself than anything. I’m viewing it as a small attempt to provide a cushion if I should find myself somewhere else, and it’s also a challenge that I can afford to take-and must take. I remember blowing on dandelions when I was a kid; I don’t remember thinking of them as clocks. Today, my daily calendar has a close up photo of a bunch of dandelions with the caption, “Dandelion clocks await a child’s puff of breath.” Today this is really special to me because, amongst other books and audios, I’m listening to Ray Bradbury’s Fahrenheit 451 and Bradbury Stories: 100 of His Most Celebrated Tales. I’m also wanting to revisit The Illustrated Man. When I see the dandelions this morning, I see Ray Bradbury. I see Clarisse holding the dandelion up to Montag’s chin. And I remember that when I was in a writer’s group for a very brief moment, one of the writers told me that I should read Dandelion Wine after having read one of my snippets. I don’t have a strong tie to my own childhood and the dandelion, but after returning to Bradbury, and the dandelion that turns up in his other stories, I feel a real resonance and connection to him. So now when I see dandelions, I see him and I’m reminded of childhood-the childhood that I know he speaks about but haven’t yet read in Dandelion Wine. I think of what a remarkable person that I imagine he was, and of course, a great writer and storyteller. I appreciate how open he is about sharing where the seeds of his stories began. I knew that if I didn’t come to the page, in this moment, that this moment would fly away just as the seeds of a dandelion, and that sometimes you just have to stop what you’re doing and GO. To be in the moment, lest it fly away, blow into the wind. 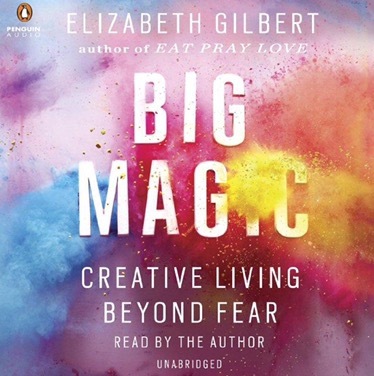 I listened to the audio version of Elizabeth Gilbert’s book, Big Magic. It’s always a treat when a book is read by the author and it works, which is not always the case–as odd as that sounds. Not only did I feel inspired by her book, I soaked up her anecdotes, and felt so excited to keep listening and learning about her experiences and synchronistic associations in navigating her writing life. This was a gem of a book, by someone that seems humbled by her experiences. And she is funny! She had me smiling my way through her book. I enjoyed it so much that I began listening to it again about two weeks after my first listen and will probably read bits and pieces on the page for a different layer of appreciation. Saturday was a good day. Each day actually hasn’t something good to appreciate, but Saturday was great because I got out of the house early before anybody was awake, even the stores weren’t quite ready for me. I started with a hot cocoa from Starbucks, then ventured over to the .99 cents store that was open. I went down each isle in search for something that I might need, being careful not to buy just because it was a bargain. I found a blank notebook. I don’t know that I really needed it; I saw it as a new beginning, a fresh start. I also bought one pack of miniature Hersey bars. I couldn’t resist. I wanted to go to the gym. My excuse for not going was that I forgot my fanny pack, which is essential for taking only what I need. I didn’t want to go back home just for that. Instead I parked the car near the bookstore, walked over to the Walgreens, which was a couple of blocks away–a little bit of exercise, albeit not as much as if I went to the gym. Finally, I ended the morning searching through the stacks of bargain books outside the bookstore. I haven’t actually done this for a while and it felt really good, taking my time, being by myself, not rushed and just enjoying some “me time.” I did find a handful of books and have started two, one is a collection of essays celebrating Harper Lee’s To Kill a Mockingbird. I need to read her much loved book. I have vague memories from my school days, but don’t feel that I’ve actually read it, so it’s on my TBR list, and I may get to it sooner than planned. I also picked up The Borrower, which has really piqued my interest. It’s quirky so far and I like quirky. Also, a Paul Auster book: Timbuktu. When I exited the bookstore, the day settled in on my spirit. The blue skies had a softeness to them, the three little birds that I saw playing underneath a car, swept past me and I could hear the flutter of their wings. I think that was the second highlight of my morning. It practically gave me goose bumps. I took my bag of books and my happy state of mind back home with me, ready to fold into the rest of the day. A trip to the library during my lunch break always revitalizes me. I feel lucky that I work close enough that I can take a brisk walk there and back, whether it’s to browse the shelves, pick up books I have on hold, sit in a chair and read, write in my journal, or post to my journal blog. Yesterday I had books to pick up. I finished my lunch at my desk, that way I’d have that out of the way, so that I could focus on the books. Lately it’s been difficult for me not to read, whether it’s the words on the page or the audio streaming through my ears. I’m being creative and trying to be efficient in my class reading, which gives me more time with other books and Mr. Kindle. Sometimes I will pull one of my old journals off the shelf and continue trying to speed read what is worth keeping, reading my words, being surprised at how, at times, my thoughts seem to come out so clear and in a way that I couldn’t duplicate in the present moment; and that makes me thankful that I, at least, wrote them down then, allowing me to reconnect with aspects of my changing self. In some cases, there are only a few sparks, so I rip those pages out and toss the whole journal in the garbage bin. Some of those pages, I recognize as having posted to another distant blog, one that no longer exists, and this makes me think that this journal blog could also one day cease to exist. There used to be a time that I wrote my thoughts, then typed them into a document, then pasted them into my blog; now, though, I skip the document part and go straight to the blog, sometimes I pen the words physically first, but often it goes straight to the journal blog, so that one day it could all disappear. I have mixed feelings about this. 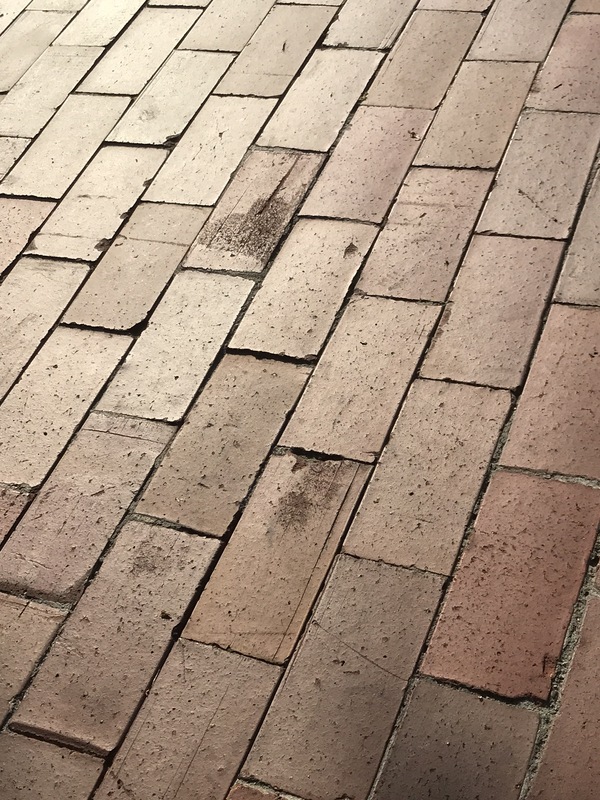 In some ways, I rationalize that it would be ok if I weren’t able to go back, to see what I was up to, but then it saddens me that I would essentially be erased. But just like the beautiful Tibetan sand mandalas that are painstakingly created and then brushed away, so these words must someday be released in whatever way that occurs. This truly was a morning page; I planned to talk about my visit to the library and was taken somewhere else. My mother-in-law was reading this one during Christmas and it just now became available from the library. She had come across it when she was doing some clutter cleaning of her own. The first page really drew me in and made me want to know more. I learned about this one through a book newsletter, I believe, maybe one of the independent bookseller lists and recommendations. From browsing the introduction and the book, this is a collection of small splashes about many creatives, from writers to authors to composers and others in between, about their routines.